Coconut flour is a natural byproduct in the production of coconut oil. Manufacturers remove coconut oil from coconut meat, and grind the remaining material to make coconut flour. Coconut flour is a common basis for baked goods in tropical regions, especially Southeast Asia. It does not contain gluten, making coconut flour suitable for consumption by people who are sensitive to gluten. The website Fitbit provides nutritional information about coconut flour. This information applies specifically to Bob’s Red Mill organic coconut flour, although brand does not significantly affect coconut flour’s nutritional content. The serving size is 2 tbsp. of dry coconut flour. A serving of coconut flour contains a total of 60 calories. This provides 3 percent of the daily value for calories, assuming the standard intake of 2,000 calories per day. Carbohydrates provide 37 calories, fat accounts for 15 calories and protein makes up the remaining 8 calories. Coconut flour has 1.5g of fat per serving, which is about 2 percent of the daily value for fat. This total includes 1g of saturated fat, or about 5 percent of the daily value for saturated fat. Coconut flour has no cholesterol. A serving of coconut flour provides 10g of total carbohydrates, including 6g of dietary fiber. This carbohydrate content provides about 3 percent of the daily value for total carbohydrates and 24 percent of the daily value for dietary fiber. Coconut flour contains no sugar. A serving of coconut flour also has 2g of protein per serving, or 4 percent of the daily value for protein. Coconut flour contains approximately 0.4mg of iron per serving. The daily value for iron is 18mg, so a serving of coconut flour provides about 2 percent of the daily value for iron. Coconut flour contains no vitamin A, vitamin C, calcium, sodium or potassium. 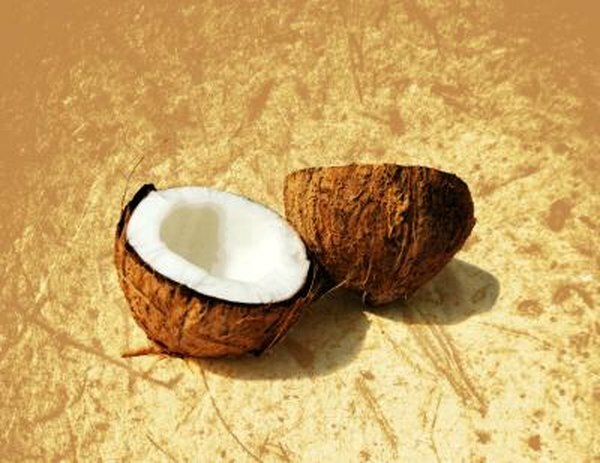 What Are the Health Benefits of Coconut Juice?